This past week my son turned 4. He asked for a party with a couple of his friends from school, doughnuts, and dragons. Clearly a young savant in terms of understanding "concept", these are definitely good criteria to build from. 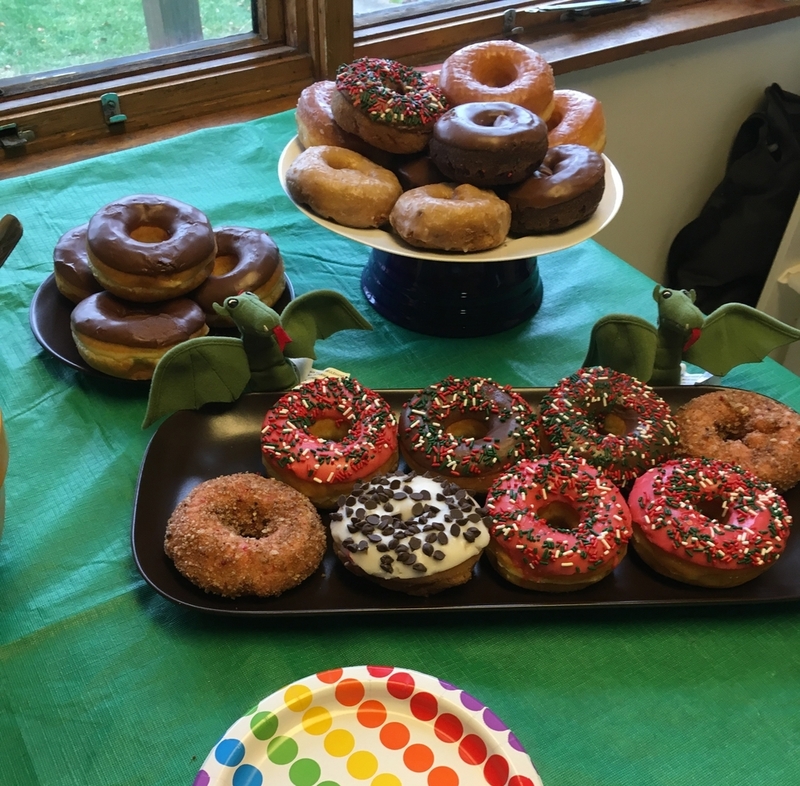 On Saturday we invited a couple close family friends and three schoolmates to a "Dragons Love Donuts" brunch party. Loosely based on the book "Dragons Love Tacos", the party was about an over abundance of baked goods. Usually party games are not my forte, but we did an activity that turned out well. Purchasing several rolls of thin washi tape and these donut balloons from Amazon, the kids decorated their doughnuts with sprinkles. Turned out to be a hit, as they then bounced the balloons all over the living room. Even though it was a breakfast party, we still had cake, per request of the birthday boy. I made a chocolate cake and added doughnut sprinkles, which were actually decorated Cheerios. It wasn't as laborious as I thought, and a few went a long way. Pure joy on the face of this birthday boy. Dragon decorations available on Amazon. I found some inspiration via Pinterest - see the board I put together for details. And see all the party pictures here.